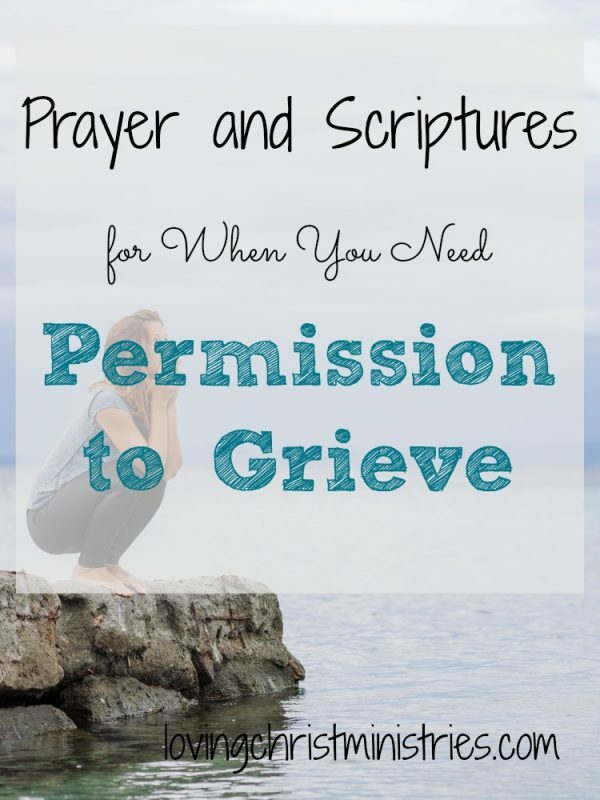 You have permission to grieve whomever, whatever, and whenever you need. I didn’t know that for a long time and spent too long beating myself up about it. I’m like that sometimes, too hard on myself. Are you like that, too? We grieve as we’ve loved. The emotions can be raw and so very real, and in a world where we focus on portraying only the happy side of life it can feel that we shouldn’t let grief overcome us. We make grief harder by beating ourselves up when we can’t get over it, when we feel our faith should be stronger, and when our grief comes from losing someone we deem as ‘not as important’ as someone else. But God gives us permission to grieve as we need to and promises we’ll find comfort in Him forever. This summer will mark 15 years since my dear friend died. I think back over the years and can’t believe it’s been so long. It truly feels like yesterday when I first heard the news. 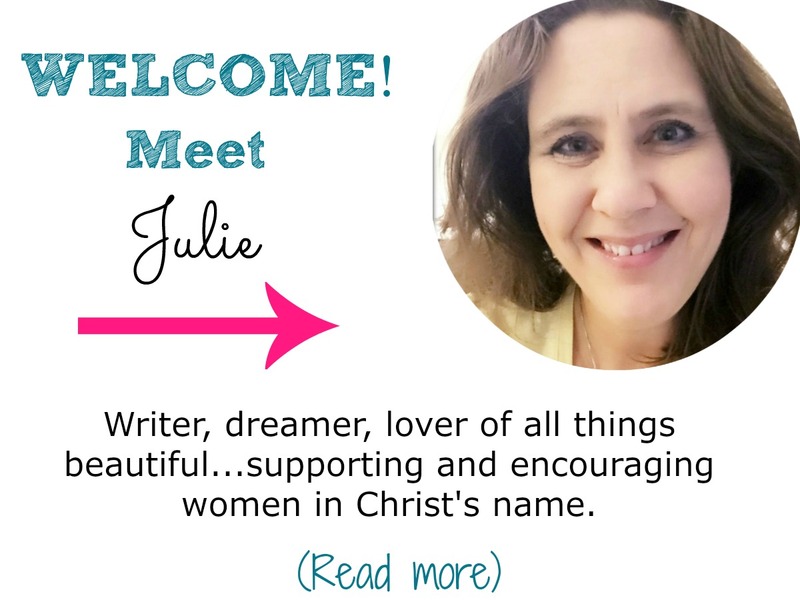 I called my husband who then raced to my workplace to be with me. We sat out on the front sidewalk and I cried into his arms as I tried to process the magnitude of what had happened. David died. I’d never see him again, hear his laugh, listen to him sing. David died. I hadn’t even been there to help him through that process. Maybe I could have done something to help. David died. Who would teach me about Christ’s love for me now? Who would look at me like I imagine Christ does and make me feel unique. Special. Worthy. Unbearable (although it ended up being bearable because I made it through with Christ, Amen?) pain gripped me. That day almost 15 years ago stands out clearly to me even now. Helplessness and hopelessness engulfed every inch of me on that day and for many days after. What followed, however, was the continuation of a faith journey that brought me closer to Jesus Christ and who I am in Him. For that, I’m so very thankful. I carried scripture with me to help me cope. I learned eventually to give my grief to God. And I heard the Holy Spirit whisper to my heart that Christ was in me and I could go on. Grief still kept a hold on me, and sometimes still does, but I learned I can move forward with God. What I didn’t know in the grief process was how guilty I would feel for grieving deeply for so long. What did that mean? Was my faith not strong enough? Shouldn’t I simply believe that everything would be okay? Was I too weak to live in faith on my own? The deepest parts of my faith came from what David had taught me. How could I learn on my own? Was it ‘dumb’ that I grieved a friend so deeply? I read stories about people losing spouses, parents, children. 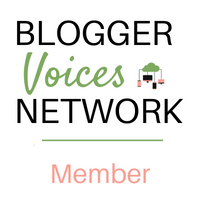 I can’t imagine such devastating losses, and I began to hesitate in sharing my story. I’d merely lost a friend. It’s interesting how in grief people want to compare their losses. I belonged to several grief support chat rooms. So many times I would watch other members try to ‘one-up’ another. It seemed it was some kind of contest on who hurt the most. I couldn’t compete with who I’d lost, and so I remained silent. The pain in grief, however, screamed loudly within. Not an eloquent prayer, but it came from my heart; I prayed the words over and over, too scared to stop and actually give it up to God. When the prayer had finally run its course, I sat silently hoping to hear God speak directly to me and tell me it was okay. I needed approval for how I felt. I wanted…needed someone to tell me it was okay. All my life, I looked to others for approval. I never wanted to disappoint. After a few minutes, I decided no voice was coming to give me my permission to grieve. Taking a deep breath, I opened my Bible, letting the pages fall wherever they chose. Looking down, I noticed right away the scripture that stood out. The pages had fallen on Matthew 5:4 – God blesses those people who grieve. They will find comfort. Of course, I’d read this verse before. But the timing of the verse, the randomness of the page, and the relevance to my fear of being ‘wrong’ to grieve wasn’t lost on me. ‘God blesses people’. All people, no conditions. Whatever the grief, whether over the death of a family member, a friend, an acquaintance, a pet, people will find comfort. If God blesses those people and gives them comfort, then it must be okay to grieve. Yes? If you’re grieving and feel guilty about your grief because you think it’s not important enough or because you think it’s gone on too long, please remember this. You’re not grieving too long, your faith isn’t too weak. No matter who or what you grieve, it matters. You matter. When you look for help in Christ, you will be blessed, and you will find comfort. I closed my Bible and reflected on the verse I’d just read. After a few minutes, I opened the pages again and again let them fall where they would. This time I read these words from Psalm 100: 5 – The Lord is good! His love and faithfulness will last forever. On the heels of reading Matthew 5:4, this promise opened up a whole new possibility to me. Grief continues on. The physical pain subsides, but missing the person never does. We will grieve as long as we need to grieve, and that’s okay because the Lord is good. He blesses us, He comforts us, and His love and His faithfulness will last forever. For as long as we need. There’s no comparison, no timeframe, no ‘too little faith’ in grief. There’s just us. Me. You. God. And within us there’s pain and love. Promise and comfort. Forever. If you’re grieving, please remember these scriptures. I actually read them every night before bed for years. Sometimes even now, even though I’ve moved on to other verses and other worries and fears, I continue to open my Bible to these words and remind myself that I do have permission to grieve. You do, too. Want to remember this? 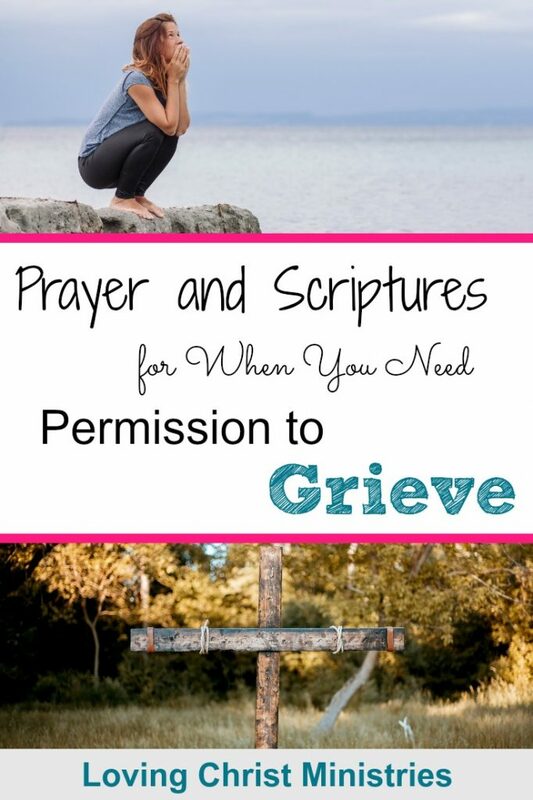 Post this image of Prayer and Scriptures for When You Need Permission to Grieve to your favorite Pinterest board!